Unless you were active in 4H or FFA, you might be under the impression that a horse is a horse. Those who have worked closely with horses, though, know the difference between a colt and a foal or a mare and a filly. The terms that describe the gender of a horse tells much more than just whether the horse is male or female. There are three or more terms that apply to each gender in horses. It may sound confusing at first, but knowing the gender terminology for horses also tells you how old a horse is. There are three words that describe female horses. The one you use to describe your horse will tell people whether she's just a youngster or if she's mature, and even if she's a mother. A filly is a female less than 4 years old, while a mare is one who is 4 years or older. A mama horse of any age is known as a dam, although typically fillies aren't dams, as breeding usually starts at age 5 or 6. There are many more terms used to describe male horses than females because they not only indicate the gender and age of the horse but can also reveal whether they are fathers, if they've been castrated or not and if they have developed and matured properly. Colts are those male horses who are less than 4 years old. When they turn 4, male horses become stallions -- unless they are castrated. Male horses who are altered are referred to as geldings. If a horse has fathered a baby, he's called a sire. Another term used to describe male horses is "rig," which refers to a male horse who either hasn't been castrated properly or has one or two undescended testicles. In addition to the multiple terms used to describe male and female horses, there are a handful of names for young horses of either gender. All horses are considered foals from the time they're born until they're a year old. 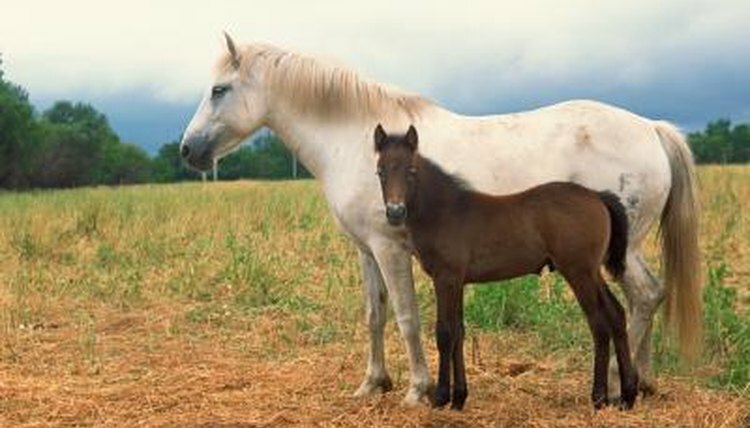 Foals can also be known as sucklings if they are still nursing or weanlings if they've been weaned. After their first birthday, horses are known as yearlings until they turn 2, at which point they're referred to by the gender-appropriate term for a horse under 4 years old.